JEEMA president Asuman Basalirwa (centre) addresses journalists as Leader of Opposition Winnie Kiiza (left) and DP’s Gerald Siranda look on. Courtesy photo. KAMPALA–Opposition political parties have announced a joint programme aimed at defeating attempts to lift the presidential age limit. A number of representatives from various parties joined the leader of opposition today to declare their collaboration in fighting a proposal to amend article 102(b) of the constitution. The JEEMA president, Asuman Basalirwa, who led the group told journalists that the collaboration would extend to nationwide sensitisation efforts to educate the public on the dangers of the amendment as well as regular prayer sessions in various houses of worship. “The aspect of prayer becomes so central and critical, we are also aware that the regime sometimes becomes so uncomfortable when we talk about prayer,” he said. He was flanked by the acting FDC president Alice Alaso, Gerald Siranda representing the DP President General and Jonathan Odur form UPC. Basalirwa disclosed that the parties have constituted a legal team to document the gross human rights abuses meted out against citizens opposed to the proposed amendment. He said the legal team will also provide legal representation for those being prosecuted for their opinions. Basalirwa condemned what he termed as lies being peddles by the NRM party regarding recommendations of the Supreme Court. The MPs in support of the proposed amendment on the age limit claim that the court recommended constitutional reforms to be enacted within two years. The JEEMA boss says this is a misinterpretation being propagated by the NRM. He accused the ruling party of continually ignoring pleas by numerous stakeholders across the country to institute electoral reforms. He notes that several proposals for reforms have been snubbed by the ruling party. “Nowhere in the recommendations by the supreme court did they talk about amending article 102.” He charged. “And if it is about fulfilling the recommendations of the Supreme Court you cannot do it in piece meal.” He added. 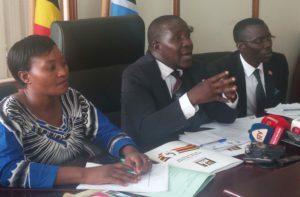 He noted that the national consultative forum of which the NRM is part made proposals to the previous parliament and removal of article 102 was not one of them. A motion to present a private members bill to lift the presidential age limit is expected to be tabled on the floor of parliament tomorrow. Several MPs vehemently opposed to this amendment have vowed to use any means necessary including physical confrontations. The leader of the opposition Winnie Kiiza has endorsed any action employed by Opposition MPs to stop the age limit motion from being presented. “When one decides to tear the papers that is his strategy….others will box, others will tear papers, others will use the gifts that god gave them of speech,” she remarked.